I'm about to pull the engine in my tii. I removed the head, oil pan, pistons, and radiator. The k-fisch set up is still on. I'm trying to figure out where to hook up the cherry picker. I see the loop on the back of the motor right above the starter, but where is a good place to hook the chain up on the front of the motor? I searched already with no real luck. Unfortunately, sounds like you removed it. It is part of a bracket on front of engine near top of head. Do a search on "Lift point". Many pictures. 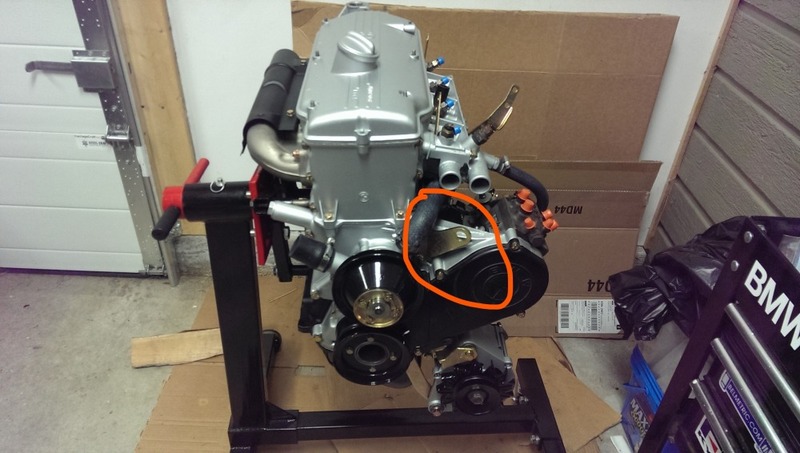 Your engine should have the hook bracket as circled on the pic. It sounds like you just have a stripped block to remove I'd get a short 12mm bolt and 2 washers and use one of the front head bolt holes with a large flat washer against the block to prevent galling the block. Thanks! That helps a ton. Hopefully that’s still on the motor. I’ll check later. For whatever reason, my motor doesn’t have the front hook. Any boss on the front right side of the block will work. You can hang the whole motor off of one 8mm bolt, so 2 or 3 in shear is bonus. I avoid using the head bolt holes only because they are critical fasteners, and the surface of the block matters. Here’s what I ended up doing: ratchet strap with one hook in the rear lift point, and the front of the strap wrapped down and around the front of the block between cyl 1 and 2 and then hooked back into itself across the top. Worked like a charm. Motor is out!